Sound familiar? Hey, we’ve all been there. How does it feel when you’re distracted? What helps you pay attention? Getting distracted can get in your way, and can make you feel really frustrated – especially if other people think you’re goofing off, when you’re trying your best. Here’s the thing: it’s not your fault. Some people (grown-ups included) just have a harder time staying focused, keeping organized, and planning stuff. News flash! Everyone has strengths and weaknesses. Even the most perfectly perfect person on the planet has stuff that’s hard for them to do, and even the folks that seem to always be making mistakes have natural strengths and awesome talents. Ever hear of a guy named Michael Phelps? Won 28 Olympic medals for swimming? How about Simone Biles? Nineteen-year-old gymnast who nabbed 4 gold medals in her first Olympics? What about Jim Carey, Hollywood star or Adam Levin, lead singer of Maroon 5? Or billionaire businessman, Sir Richard Branson? Know what they all have in common? As kids, all of them had a really hard time sitting still and paying attention. School was often really boring for them, and they struggled with it. It sure didn’t stop them from taking the world by storm, did it? Take a second and think of three of your strengths – go ahead, I’ll wait . . . . Got ’em? Maybe you have an amazing memory, or a killer sense of humor or incredible balance, or maybe you’re a master builder or a born leader or a whiz at languages, or the backstroke or ventriloquism. Raaaaaaahhh! (that’s the roar of the crowd cheering for you). You’re awesome! Okay, now let’s look at the skills that need work. Still with me? Cool! Your brain’s sort of like a control room, and in that room, there’s a big, important control panel where the Head Honchos sit. It’s the “Get Stuff Done” part of your brain (also known as the “Executive Functions”). It’s the part that makes sure you pay attention, stay organized, remember stuff, control your impulses, and all sorts of other things. Some of the Big Bosses that work on this control panel are totally nailing their job, and some of them aren’t doing their job as well as they should be – they just need extra training and practice, to improve. How can you improve those skills, so you’re not quite as distracted? So, if you absolutely hate homework, ask yourself, which part do I dread the most? Maybe it’s getting started or maybe it’s finishing up. Maybe it’s the writing, or the word problems in math. Some people learn best when their bodies are moving; it keeps their brain from falling asleep. Now, you can’t shoot hoops or do backflips in class but that’s okay; small movements perk up your brain too. Talk with your teacher about using a fidget – just keep it quiet and on your lap, so it doesn’t distract the other students. If the first kind you try doesn’t help, try a different type – there’s tons to choose from! Ever been on a long hike and felt like you couldn’t take another step? You probably took a little break, drank some water, and felt ready to hit the trails in no time. Well, our brains get tired too, especially if the work’s hard. If you’re having a tough time paying attention, ask your teacher or parents if you can take a little break. Just keep it short (three minutes or less) and make it active (do jumping jacks or walk to the water fountain). If you keep forgetting things you need regularly, like your homework or soccer cleats or your snake-charming basket, your brain is telling you, “Dude! How ‘bout a little help here?” What you need is a list! Keep it short and hang it somewhere you can’t miss it – on the front door, your planner or a suitcase tag hanging off your backpack. Once you get used to seeing it there, move it to a new location. 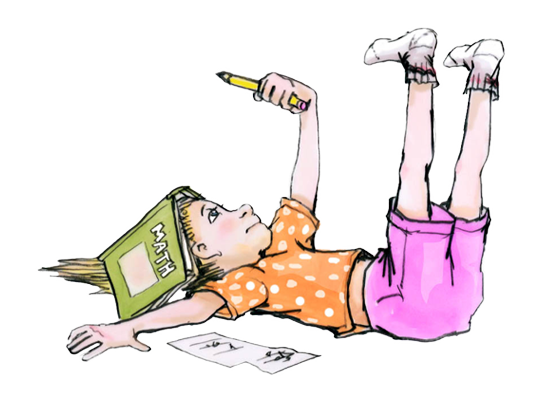 Are you fed up with hearing your parents nag you to study for your math quiz or make your bed? Replace them with robots! Reminders you set up yourself are a lot less annoying (and more independent). Program a watch to beep or vibrate, set an Ipod to deliver a message, or just stick a Post-it on your fridge or bedroom door. Keep on trying. Be kind to yourself. The sky’s the limit, so let yourself fly high.